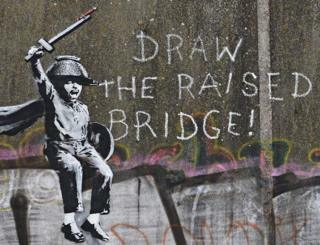 A mural by graffiti artist Banksy has appeared on a bridge in Hull. Speculation about the artist's identity was rife after the work, on a disused river crossing, was spotted by passers-by on Thursday. The stencilled design depicts a child carrying a wooden sword with a pencil attached to the end, under the text "Draw the raised bridge!" Images of the mural were shared on Banksy's official Instagram account on Friday. The elusive street artist posted two photos of the permanently raised bridge, situated on Scott Street in the Wincolmlee area of the city. Who is the street artist Banksy? Hundreds of fans responded, with some expressing surprise at the location and others speculating on the meaning of the work. A number of users suggested Hull's recent run as UK City of Culture may have inspired the decision. And many were quick to link the work to Brexit, after recent pieces which touched on the UK's impending departure from the European Union. Last May, Banksy unveiled a mural in Dover which depicted a workman removing a star from the EU flag. Globally, 169 million children were not given a first dose of the measles vaccine between 2010 and 2017.